Swaffham Mill Lane post mill worked on the site for over 200 years, although it was probably updated or rebuilt during that time. The mill buck was set on a roundhouse and was turned to wind by hand via a tailpole (broken in later years) on a carriage with two small tandem wheels attached to the mill ladder. Power was originally supplied from two pairs of common sails but by 1838 one pair of common sails had been replaced by a pair of patent sails to drive 2 pairs of French burr stones, flour mill and jumper. A Strong Active Single MAN who can take the sole management of a Mill. Application to be made to S. Sudbury, Swaffham; if by letter post paid, stating recommendation, age and size of person. A Strong Active Single MAN who can take the sole management of a Mill. Application to be made to S. Sudbury, Bookseller etc. 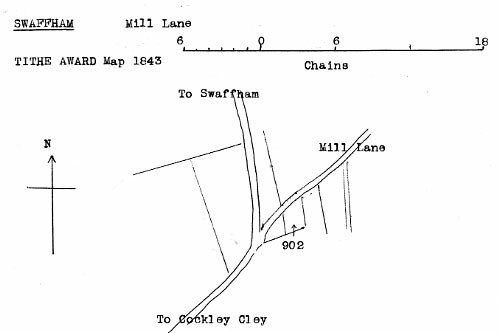 Swaffham; if by letter post paid, stating recommendation, age and size of person. Mill & Land Cley Rd. The Business of a MILLER and BAKER. Established for sixty years and upwards with a substantial and suitable Dwelling house, Shop and Baking Office and extensive Premises replete with every convenience situate in the Market Place. Also a Post Wind Mill with spring sails, driving two pair of French Stones and going gears complete. Three Cottages with the Gardens thereto belonging and one Acre of Pasture Land situate about a mile from the Dwelling house. The Mill, Cottages and Land are intended to be Let. The Dwelling house and Premises in the Town will either be Sold or Let ... Immediate possession may be had. Apply personally or by letter post paid to Mr. Sewell, Solr. Swaffham. 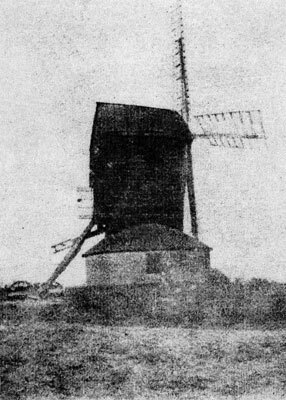 A POST WINDMILL driving two pair of French Stones, with a pair of Spring Sails and Flour Mill complete, with Granary and House and with or without Land. Apply to Mr. Lack, Market Place, Swaffham. At the meeting the Registrar will receive proofs of the debts of the Creditors and the Creditors may choose an Assignee or Assignees of the Bankrupt's estate and effects. To Let, with immediate possession, an excellent POST WINDMILL with two pairs of French Stones (nearly new), Flour Mill and Jumper, two patent sails etc. The whole in good repair. Apply to Mr. James Philo, London Road, Swaffham. In the matter of George Jennis Smith of Swaffham aforesaid, Miller and Baker, being adjudged Bankrupt on the 20th day of June 1866. An Order of Discharge will be delivered to the Bankrupt after the expiration of thirty days from this date, unless an appeal be duly entered against the judgment of the Court and notice thereof be given to the Court. TO BE LET with immediate possession or at Michaelmas next, a good WINDMILL with two pairs of French Stones and roundhouse. Capable of holding 60 or 70 quarters, all in thorough repair. Apply to J. Philo, London Street, Swaffham. The above advertisement appeared in the Norfolk News on 14th November 1868 but the bankrupt's second name was given as Jervois instead of Jennis. In the matter of George Jennis Smith of the Parish of Swaffham in the county of Norfolk, Miller and Baker, adjudged Bankrupt on the 20th June 1866. WANTED immediately, a trustworthy competent MAN to work a Post Windmill. Apply to William Barnes, Swaffham. Valuable Copyhold Estate comprising 13a. 0r. 17p. of Excellent Land. Capital POST WINDMILL in good repair, Two desirable and well built RESIDENCES with bake office, cooper's shop, yard, stabling and outbuildings. Two excellent SLAUGHTER HOUSES, with stabling, piggeries etc. is favoured with instructions from the Trustees under the Will of the late Mr. James Raven to Sell the above by Auction at the Crown Hotel, Swaffham on Thursday May 30, 1872 at 2 for 3 o'c. WANTED, a MAN to Work a POST WINDMILL. Apply to W. Preston, Swaffham. The extensive and old-established business conducrted in Swaffham by Mr. William Barnes, miller, baker, and corn dealer, is of considerable importance to the welfare of the community, as through the agency of this concern a constant supply of good pure bread is ensured. The premises occupied by Mr. Barners comprise a shop which fronts to Mangate Street; and there are also several large granaries at the rear for the storage of flour, corn etc. At this establishment there is a daily supply of pure home-made white and brown bread, prepared in the best manner, and affording the highest satisfaction to the many purchasers of it. In addition to his business as a baker, Mr. Barnes is also an extensive dealer in hay, offals, malt and hops, Scotch oatmeal, dog biscuits, linseed, linseed meal, farm seeds, bird seeds, German yeast and similar goods, of which he has on hand a large and well-assorted stock; the various articles being of really superior character and commanding a ready sale. He is also agent for the celebrated Hungarian flour; while in all the branches of trade mentioned he has a most influential and widespread connection, which has been built up during the twenty-five years this business has been in existence. May 1872: Mill advertised to be sold along with bake office, cooper's shop, two slaughter houses etc.